Undertake post-emergency evaluation and debrief. 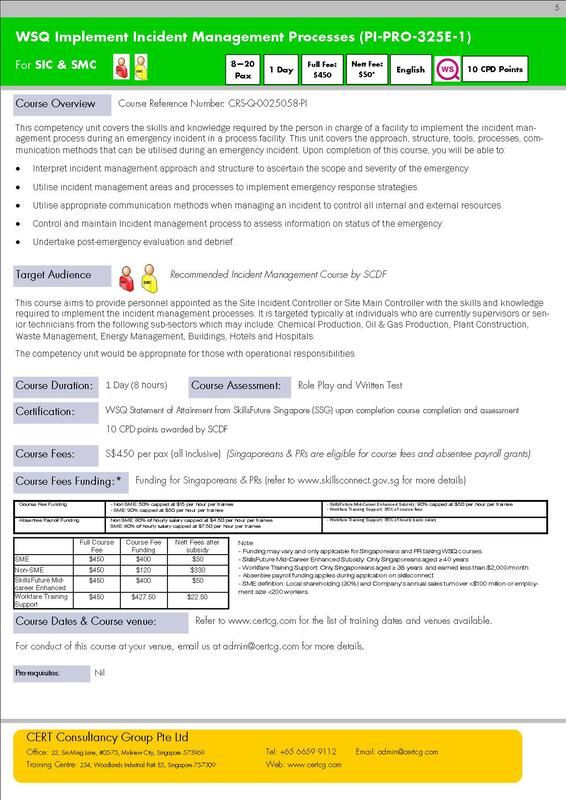 This course aims to provide personnel appointed as the Site Incident Controller (SIC) or Site Main Controller (SMC) with the skills and knowledge required to implement the incident management processes. It is targeted typically at individuals who are currently managers, supervisors or senior technicians from the following sub-sectors which may include: Chemical Production, Oil & Gas Production, Plant Construction, Waste Management, Energy Management, Buildings, Hotels and Hospitals. A Statement of Attainment (SOA) from SkillsFuture Singapore (SSG)(WDA) will be awarded upon the course assessment completion.